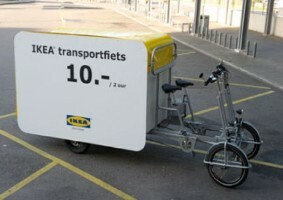 IKEA, the Swedish furniture store has recently, introduced a ‘cargo-bike’ rental scheme for customers at its Delft store so they can ‘pedal’ their purchased furniture home. Currently, they are two tests bicycles available for customers with rental charges starting from €10. IKEA, the Swedish furniture store has recently, introduced a ‘cargo-bike’ rental scheme for customers at its Delft store, so they can ‘pedal’ their purchased furniture home. The cargo bikes were developed by TU Delft (Technical University of Delft) and can be used by IKEA customers to transport furniture up to 250kg. Currently, they are two tests bicycles available for customers with rental charges starting from €10. Cargo bikes are flexible in that they can they can be used to either transport shopping or goods, or with minor modifications carry passengers. At the moment, there are no further plans of expanding the scheme to other IKEA outlets in the Netherlands.